The d'vine Chill - 2 Piece Chill Stick Set Includes: 1 -12.5 Inch d'vine Chill Rods & 1 attachable FDA approved Acrylic Aerator, Pourer that features a Soft Rubber Stopper for a Drip-Free Seal. Now you can ENJOY Chilled White Wine, Champagne, or Liquor no longer WATERED DOWN by ice cubes or maintain the temperature of Red Wine straight from the bottle. The BEST all in 1 Chill Set Available. 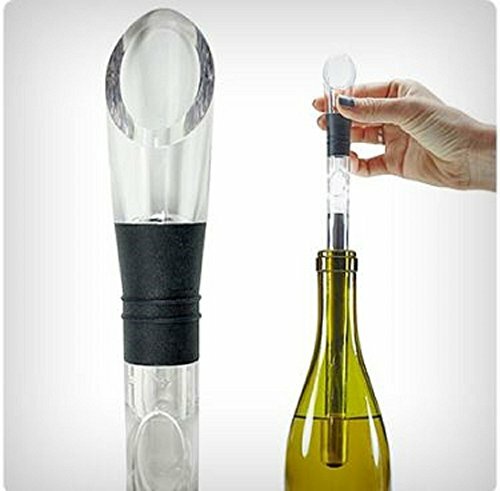 The Aerator/Pourer ENHANCES your Wine Drinking experience from the first taste. A MUST HAVE ACCESSORY for all Wine ENTHUSIAST. The d'vine Chill is an excellent Gift or Hostess Gift for Wine Loving Family & Friends. The d'vine Chill is easy to use. Freeze the Stainless Steel Wine Rods for about 2 hours or until there is a nice layer of ice formed on the Chill Rod. Screw the Aerator/ Pourer to the Chill Rod. Pour enough wine out of the bottle to insert the d'vine Chill snuggly into the bottle without losing a drop of wine, pour & enjoy. The d'vine Chill will keep your wine or spirits chilled for about 1 hour. Light dry white wines, rosés, sparkling wines: Serve at 40° to 50° F to preserve their freshness and fruitiness. Full-bodied white wines and light, fruity reds: Serve at 50° to 60° F to pick up more of the complexity and aromatics. Full-bodied red wines and Ports: Serve at 60° to 65° F-cooler than most room temperatures. Easy to clean - Unscrew the Aerator/Pourer from the Chill Rod. Hand wash in warm water and let air dry. Once dry, return the Chill Rod to the freezer so it is ready for your next bottle. 2 PIECE SET: 1-12.5 d'vine Chill Rods and 1 Aerator/Pourer- ENHANCE your Wine drinking experience. ENJOY CHILLED Red or White Wine, Champagne or Spirits without being "Watered Down" from Ice cubes. Hand wash the Chill Rod, freeze it, then it's ready when you are. BEST ALL in 1 Chill Set Available Sold EXCLUSIVELY through d'vine Products. If you have any questions about this product by d'vine Products, contact us by completing and submitting the form below. If you are looking for a specif part number, please include it with your message.